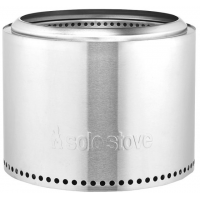 The Alcohol Burner is a great backup fuel source and companion to the wood-burning Solo Stove (sold separately). 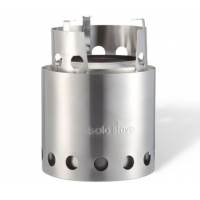 When used inside the Solo stove, it boils faster due to the efficient airflow system. This portable fire pit delivers a hot, efficient fire in a clean, stainless steel package. 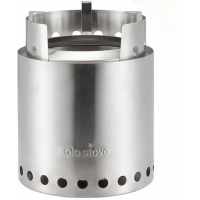 Best of all, the Solo Stove Bonfire minimizes smoke, so your neighbors won't be anything but envious. By raising up your Bonfire with the Solo Stove Bonfire Stand and allowing more airflow to pass underneath, you'll be able to enjoy your fire pit on more heat-sensitive surfaces such as wood decks. With double-wall construction, the Solo Stove Campfire wood-burning camping stove is a natural convection, inverted downgas gasifer stove. Tame your flames with the 2-piece Solo Stove Fire Pit Tools set. The stainless-steel log grabber and an angled poker make it easy to adjust the wood in your Solo Stove fire pit for a perfect burn. The Solo Stove Flex Strap Bowl in a package of 2 lets you securely hang the bowls from your pack to save precious pack space. Different colored straps ensure each camper uses the right bowl. This 2-pack of Solo Stove Flex Strap Plates offers a unique take on the traditional camping plate. They allow you to securely hang the plates from your backpack to save precious pack space.